Earlier this year Nintendo of Europe released a Wii U eShop sizzle reel of upcoming games, some of which were seen for the first time in that Nintendo Direct broadcast. 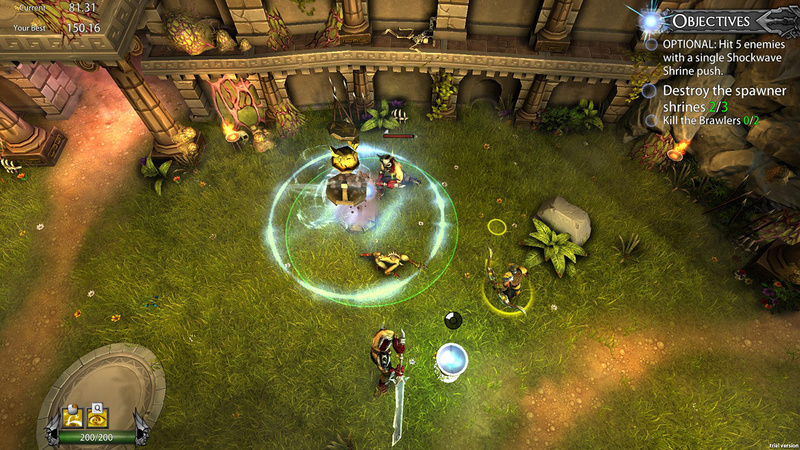 One of the many games given a few seconds to shine was FORCED from BetaDwarf (a studio based in Copenhagen, Denmark), an arena brawler with a top-down viewpoint that, though playable in single player, is best suited to co-op. 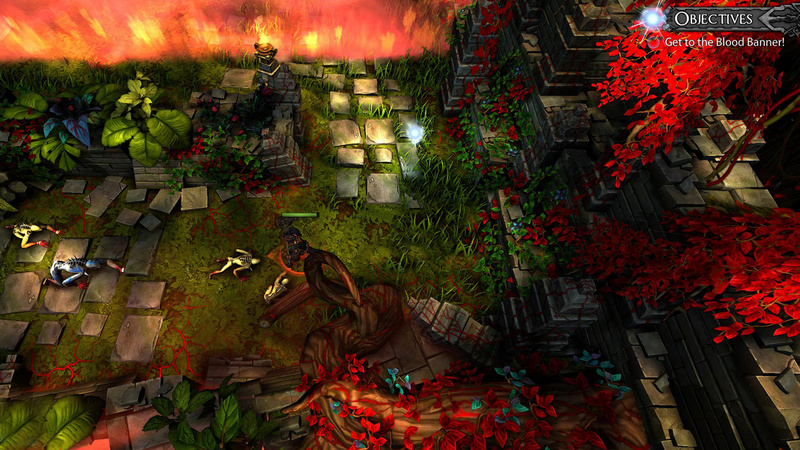 We had a brief play-through at Eurogamer Expo recently, and comparisons to isometric brawlers such as Diablo are understandable, if not quite on the mark. With two players, the basic goal of the demo was to choose a character class — there are the expected options of those with range attacks, greater speed, powerful tank brawlers — and work through a number of trials, slaying enemies and solving some light puzzles. In our case there were two players, and so some of the tasks were undoubtedly most intuitive when we worked together, while the gameplay on show was solid; as a game with plenty of abilities to reveal and power-up, we naturally barely scratched the surface. 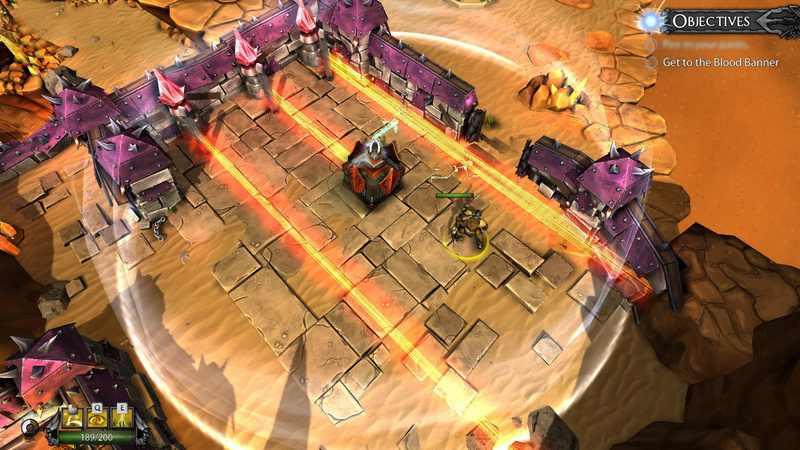 It left a positive early impression, however, and we took the opportunity to speak to BetaDwarf's Steffen Grønning, who is the CEO and Game Director of the company. In a frank and honest interview, Grønning outlined the studio's early struggles, its heartwarming crowdfunding success, some frustrations with bringing the game to multiple platforms and the studio's experiences so far with Nintendo. Nintendo Life: First of all, can you introduce yourself and BetaDwarf to our readers? Steffen Grønning: I’m Steffen Grønning and I’m from Denmark, the CEO and Game Director at BetaDwarf, and we’re making FORCED. Our studio has been alive for three years; we started at a Danish University where we basically moved into a classroom illegally, and we lived there for seven months until we were thrown out by the university who discovered us! Then we moved into a big house where we all lived together. Then we did our Kickstarter, and that allowed us to move into Copenhagen where we’re living now, so half of the team is living together still while some have found apartments. NL: So how long has FORCED been in development? SG: It’s the only game we’ve been developing, so three years. NL: Were you surprised by the success of your Kickstarter campaign for FORCED, as it went quite far past its goals? SG: It was an emotional period because we almost were not making it, then one night we made a picture that described our progress as a team and put that on IMGUR. It went totally viral, so more than a million people saw it, and then we were funded overnight; that was really, really great. NL: Can you give us a high-level summary of FORCED, such as how it works and what gamers can look forward to? SG: On the surface people say it looks like a MOBA, but it’s not really a PvP, more of a campaign to go through. People also say it looks like Diablo, but it’s way more skill-focused rather than loot-focused, and has an arcade feel. The story is based on the idea of gladiators, so you are slaves at the toughest gladiator school in the world, and you are forced to fight there until you potentially earn your freedom. So you go through these tests and have your spirit mentor with you, and you play 1-4 players, and the interesting thing is that the spirit mentor is like a co-op mechanic. So you can control him by pushing a button and he floats to your character, and you have to utilise his path and control him together as a team; it becomes really collaboratively demanding and interesting because people have a lot of reason to communicate. NL: So it is a game where working together is the key, then? SG: Precisely. You have to figure out how to evade these enemies, how to attack them. Ideally we also sometimes call it almost like a raid in World of Warcraft, but without all the bull*** *of grinding, it’s just the interesting part where you have to consider how to beat this enemy. NL: So is this a sequential campaign, or do you just select individual stages to take on? Ideally we also sometimes call it almost like a raid in World of Warcraft, but without all the bull**** of grinding. SG: It’s really funny because it’s inspired by the campaigns in Crash Bandicoot, so in that way it’s also a bit arcade-ish. You have to go through five worlds and in each world there are six different tests for you as a gladiator, and in each of them you can collect three crystals, kind of like in Crash Bandicoot. So you have to gather a total of 50 crystals to meet the ultimate test, and that’s your key goal in the game. NL: Is this going to be local and online co-op, and if so do you consider one to be more suitable than the other? SG: It’s local and online co-op, and we made a huge effort to make the local co-op really cool. So there’s no splitscreen, we simply just make sure that every arena you’re in fits the maximum zoom of the camera. So it feels like more of a game actually made for local co-op. And yeah, you can play online, and you can even sit with two players on a computer together and still join an online team, so that way you don’t need too many copies of the game to play. If you want to bring a friend over they can just join you and you can play with others online if you want to do that. NL: Are the levels still the same in single player and co-op, does the game just scale the difficulty? SG: So what we did there is… it’s really hard to design a game that’s fun in both single player and multiplayer, and our challenge was to make it fun for 1, 2, 3 and 4 players in each trial. So essentially we ended up designing each of the trials to be slightly different for each number of players, so that’s why there are sort of four campaigns. For instance we have a level where there’s a dark mist, and that mist spreads quicker if you have more players, and you can also meet enemies that are far more dangerous when you play multiplayer; they’re designed to be more of a challenge towards more players. So it should definitely fit the number of players that you have. NL: At what point did you decide to bring this to the Wii U? How was it initiated, did you decide or were you approached by Nintendo? SG: That’s actually a funny story because we were at a friend’s release party and we met Nintendo there. We’re old-school fanboys of Nintendo, and I hadn’t really considered FORCED for Wii because of the control schemes, but I really wanted to bring the game there. Then I realised the GamePad on Wii U fits it, and the Pro Controller also fits, and the Wii U is way stronger than any consoles out there right now; then we talked a lot about that at the party and then we realised, OK, FORCED might be a really excellent fit for Wii U. So we were hyped about that and started porting it. NL: Have you done anything different with the GamePad that’s not on other systems, or have you focused on getting the game ported as is? SG: Right now a couple of the designers back home are considering how we want to utilise the GamePad screen in some way, so we’re trying out some different stuff. So far we’re not really satisfied, we’ve found one thing — I can’t mention what it is — that we’re kind of satisfied with, but we want an additional thing. It’ll be something with the screen, I think. NL: Have you have much time to look at the lineup of the Wii U eShop? Do you think it’s going to be a positive marketplace for you, or is there a long way for it to go? I think for the Wii U in general there’s a long way to go because of the unit sales, but whenever I hear about the community it seems to be the greatest gaming community. SG: I think for the Wii U in general there’s a long way to go because of the unit sales, but whenever I hear about the community it seems to be the greatest gaming community. Everybody’s really inclined to try out new games, so in that way it actually becomes an interesting platform, because we only need to sell, say, 15-20,000 units for it to make sense for us. That is do-able on the install base right now, so for us it makes sense and we want to support the old-school dream. NL: Do you have a target release window for FORCED? SG: Not really, and that’s extremely annoying. It’s actually because of Microsoft, the Xbox One requirement is that you’ve not released on another platform before, so what we’re doing is that we have to port it for PS4, Wii U and Xbox One simultaneously, and release it on all three platforms at the same time; that’s annoying because we could in theory release it on Wii U in January or something like that. But now it might be later because we have to do all the porting work on all of them at the same time instead of doing them one by one. NL: From that perspective, have you found Nintendo quite easy to work with, or are there still aspects to the eShop model that are clumsy or awkward for smaller developers? SG: So far everything’s been really nice. The response time for Nintendo is marvellous, we haven’t been into the extreme technicalities of porting yet but I’m guessing they also have great support there. They were really good at helping us out with technology and so on, so I’m really pleased with them. NL: Are you using Unity, and has that asset been a big help working on Wii U? SG: So far it’s really good, yeah. There’s always something comes up when you’re testing networking all over the place, seeing loading times are fine and so on, but right now it looks really good and promising. NL: To finish up, how would you pitch FORCED to prospective owners on the Wii U? SG: We’re targeting co-op players that like a challenge, because it is very challenging. Our philosophy is that you sit in a group on the couch with this game, for instance on the weekend when you want to have fun with your friends, and I think this is the ultimate experience for that. There aren’t many games out there that’ll challenge you as a group and have a lot of variation. There’s not really a lot of co-op titles out there. We'd like to thank Steffen Grønning for his time. Let us know what you think and whether FORCED is on your radar in the comments below. Wow that game looks awesome I cannot wait! This is what Skylanders should be!!!! LMAO!!! Go ahead take my money already I can't wait to play this! Anyways, great interview! Looking forward to FORCED on Wii U! I start seeing why many indie developers just chose to ignore Xbox One altogether. Draconian policies won't help anyone, Microsoft. Looks great! If the price isn't too steep this is one for the wishlist! I wonder if this next-generation will see more indie games on Wii U and PS4 simply because Microsoft will continue to force delays. Time to get with the times MS especially if Xbone sales are way behind Sony which seems to be the way it's going to start off. I worked with these guys for half a year as a graphic artist. Great studio and the most dedicated bunch I've ever seen. Can't wait for this to land on the Wii U - it will suit it perfectly. The gall of demanding indie developers to choose whether to ignore a potentially lucrative market or port and wait further to achieve needed revenue is revolting. These companies need to put their work to market more than Xbox needs a market undiluted by late ports. This is a bigoted, discriminatory policy that only hurts hard-working developers and Xbox customers. For shame. Saw a Video Games Awesome stream of the game yesterday, it looks quite good. Really chaotic and fun co-op sort of thing. I don't think this is really for me, but I wish it was, lol. "NEXT" lol, I"ll keep this on the radar, looks like it could be quite some fun. I'm big into couch co-op and this looks pretty damn good. So yeah, FORCED is definitely on my radar. Looks great, and I'm always looking for cool co-op games. Got to remember this one. cool looking game. Makes me feel old with all the weird comparisons and not a mention of Gauntlet anywhere. How is this not an homage to gauntlet, the ORIGINAL of these kind of games? Anyway looks fun. It actually looks more like a 3DS game but it's another thing that will entice me to a WiiU if it ends up really good. Unfortunately if it's on the other consoles I can't see why I'd need a gamepad to enjoy it, and might be more inclined to get it elsewhere. Could be a nice opportunity for 'asymetrical' co-op, though, if one person can be the team leader using swipes for magic and strategic stuff or something, or assigning magic and abilities to different players with different stylus moves over them, or maybe dropping items down for players in some way. Like a dungeon master with the gamepad. I'm looking to check this game out soon, looks like a fun co-op title.